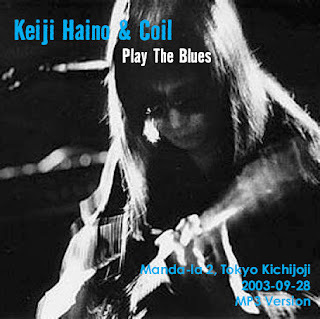 tremendous live errrr... blues gig from genious of japanese avant-garde. HAINO picked real tnt-blues classics (hoochie, suzie q, spoonful & got my mojo workin) and turned it into great improv. in pdf attach written that "this is free mp3 bootleg". not to be sold but distributed freely. Cite: "Haino is the name to follow in underground circles in Japan. Notorious for the noise he makes on his guitars, this short 45-min set has him with Coil stripping the blues to the bone. You’ve never heard these blues standards played like this before. This gig is part of the tenth anniversary celebrations for the Maboroshi no Sekai label. The band are Keiji Haino [vocals, gtr, harmonica], Natsuki Kido [gtr], Takeharu Hayakawa [bs] and Eiji Tanaka [drms]. This is a fine DAT audience recording, never released before."